As you can probably guess from the title, this is going be a review of Mark Ling’s AffiloBlueprint. Now rather than bore you to death with a terribly boring review like most other people have, I’m going to give you all the important information in a convenient bullet-point list, then like an good jury reach a considered verdict at the end. From there you will be able to draw your own conclusions and buy AffiloBlueprint 3.0 if you wish (and yes, my affiliate link will be on offer; but this costs you not one red cent more). * This is the latest version of AffiloBlueprint, following on from AffiloBlueprint 1 (which was a live seminar/workshop-type thing) and AffiloBlueprint 2.0, which set the basic formula. 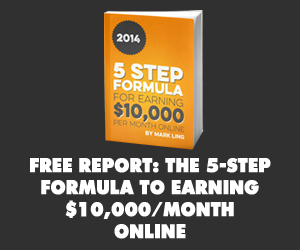 * AffiloBlueprint 3.0 is a totally step-by-step program. What this means is that every aspect of making a profitable affiliate website is covered, from getting the right mindset, to keyword research, picking a domain name, finding products, writing content, getting ranked, and making more sales with SEO and PPC traffic. * Each lesson is a 10-20 minute video with accompanying PDF lesson notes. * Each “Step” (such as “Keyword research”) has its own homework that you can tick off as you progress. I would highly suggest doing this homework as it serves to keep you on the right track and ensures that you make good progress. 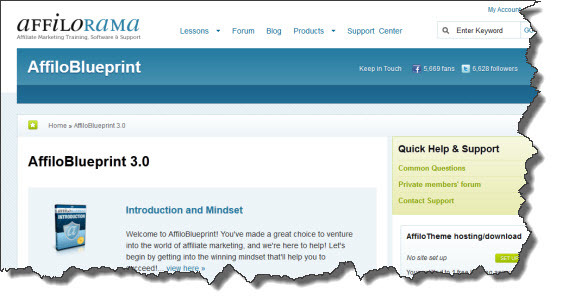 * With AffiloBlueprint 3.0, you also receive bonus access to AffiloTheme (which I have used to create this very website, among others). This is a premium WordPress theme that is sold also as a standalone product. You get hosting for your first affiliate website as well, which is very handy because it cuts down on your starting costs. * The whole AffiloBlueprint site-building process should take you anywhere from 2-12 weeks to get your site complete (depending on how much time you have spare). If you can afford to outsource content creation, then you are obviously in a superior position. * The whole point of AffiloBlueprint is to create websites that earn you at least $50 per week in commissions (but preferably more, of course). * The videos are narrated by various members of the Affilorama.com staff team, so don’t be concerned if you don’t actually hear Mark’s voice on camera. * You can make your site to sell digital affiliate products from networks like Clickbank, or physical products from Amazon, CJ.com etc, or CPA offers (if you can crack CPA offers, then you will make SERIOUS money). So now that you know what AffiloBlueprint 3.0 is, it’s time to actually review the product properly. I’m not going to do some outrageously long winded thing here, but instead tell you that AffiloBlueprint is a great option for anyone looking to build a real business online from affiliate marketing. It doesn’t offer the fastest route to online income – if you need money right away then you would be better off to look into selling digital services, or some form of social media marketing such as using Pinterest to drive traffic to an affiliate offer. Don’t think for a second that you will get rich overnight using the AffiloBlueprint method, because that isn’t going to happen – you will need to be patient and dedicated. However, with the superb customer support on offer by the AffiloBlueprint staff (they actually go out of their way to help you succeed) and Clickbank’s robust 60 day money-back guarantee you cannot actually go wrong. I strongly advise anyone who is interested in making money online to build a real business, as opposed to simply trying different cash grabbing strategies that will ultimately fail in the long run. That’s where I review AffiloBlueprint 3.0 as being its strongest; when it comes to building an actual digital business from affiliate marketing, no other product is stronger. Click here for more information about AffiloBlueprint 3.0 and your chance to buy. Though I didn’t buy the blueprint,Sam but then I’ve always know Mark and what he stands for,not talk of his affiliorama forum and blog and his Traffic Travis. Hey man!Good job on getting that first site rinunng. The first one is the hardest.AffiloBlueprint is a great course. It is how I got started in this online marketing game. You can learn a lot from it and even though I’ve switched to Adsense primarily for my website income, it helped me get there.